Held once every 12 years, in the afternoon of September 24, at Takayasu in Tomigusuku, the Gan-go Festival was held. On September 24, the Gan-go Festival was held in the area around the Takayasu Public Hall in Tomigusuku. The festival is held once every 12 years, on August 9 of the year of the Dragon in the Chinese lunar calendar, to wish for residents’ good health and prosperity. During the festival, the residents paid tribute to spirits by performing dances, bojutsu (stick fighting) and hatagashira, a parade carrying large flags. Gan is a sacred palanquin used for carrying a coffin. It is said that the Gan of Takayasu was brought into the Takushi clan in the Tomigusuku district about 250 to 300 years ago. It was destroyed during the Battle of Okinawa but a replica was created in 1952. Once every 12 years, in the year of the Dragon, people carry out repairs on the Gan and hold a festival to pray for the spirits of the Gan and for safety in the community. Locals offered prayers from the morning and moved the Gan from where it was in storage to the public hall. 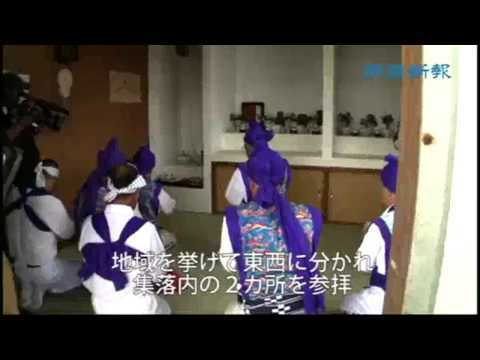 Then, in front of the public hall, they performed hatagashira, bojutsu and dances to drive away bad luck. The mayor of Tomigusuku, Haruki Gibo, also participated in bojutsu and helped lift the spirits of the people. Separating into two groups, they then moved towards the east and west and performed dances and bojutsu in Takayasu. 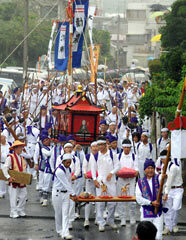 During the finale, the participants carried the Gan about 400 meters from the public hall back to where it would be stored. Local residents and many tourists took part in the festival despite the rain, and it being held on a weekday.